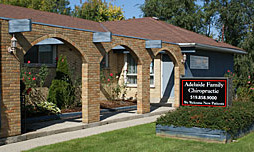 We are located on the west side of Adelaide Street, between Cheapside and Huron. We are located on the west side of Adelaide Street, between Cheapside and Huron, at Lambton Street. Look for a single storey building with brick arches in the front. You’ll find ample free parking on the north side of the building. Enter off of Adelaide St. There is a bus stop right beside our office for the L.T.C. Adelaide bus route 16. The following bus routes stop within one block of our clinic: Kipps Lane / Thompson Road Route 1, Huron Heights route 21, Fanshawe College route 27 and Windermere route 32.